For several years, I have had a dream and vision of creating a community where people can come to find peace of mind and solidarity. In autumn 2011, I found a house that would fit the purpose. It was the right size and had a large plot of 5600 sqm. The house, located in Byvalla, had been empty for many years and it was in pretty bad shape. Byvalla is a small village in south eastern Dalarna in Sweden, 6 km outside Horndal. 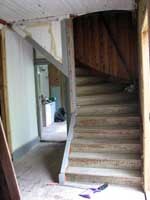 Over the last two years we did woodwork, painted and made ​​improvements to the house so that it´s possible to live there. The first time we arrived there was no electricity and several windows were missing. During the summer of 2012 we had our first retreat in the house. So far, it is most useful as a weekend house, but it is also possible to go up there during the winter. The house was previously used as a permanent residence and I hope that in future it will be possible to live there all year around. Personally, I like being there during the autumn and winter days. The house consists of 6 bedrooms, 2 living rooms, kitchen, toilet and a large hall. We are still in the beginning stages of starting the community. My next goal is to get the kitchen, living room and dining room ready. Water is now connected from a local spring that is shared by the village. Sewer is available both in the kitchen and toilet. Since I bought the house I have kept on renovating windows which will soon be ready. My daughter has also helped me and been supportive of the renovation. Slowly the house takes shape and becomes more and more complete although there is much left to do. What will happen with the house? The house will develop in such a way as we want it to. It will be a metamorphosis process. In society the interest of small spiritual places starts to grow. The stress and the fact that we lose ourselves more and more in the outer world make us long to go back to simplicity. My wish is to make Byvalla a place where spirituality is encouraged and personal growth takes place. We have now finished several retreats during the last two years. Despite a simple accommodation everybody liked the courses. In neighboring property we rented meditation room, bedroom, toilet and shower. Here are some pictures from the retreats.